The man charged with the 2011 kidnapping and murder of nursing student Holly Bobo tried to threaten his brother, according to an arrest warrant for coercion of witness obtained by News 2 Wednesday. The document, an affidavit of complaint filed Tuesday, April 1, states Zachary Adams tried to get a message to his brother, who is in custody in the Obion County jail, through another inmate and said, "Tell my brother he is the one who started all this s#%t and if he don't shut his mouth he will be in the hole beside her." 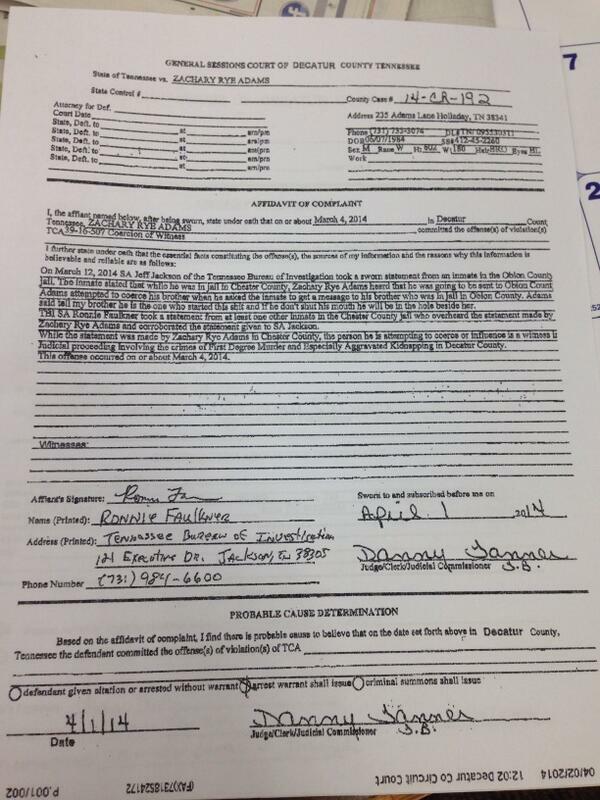 The arrest warrant states Adams made the statement to the inmate on March 4. At the time, Adams thought the inmate was going to be transferred to the Obion County jail. The inmate reported it the Tennessee Bureau of Investigation and another inmate, who overheard the statement, corroborated it to a special agent with the agency. The TBI stated in the affidavit that Adams was trying to coerce or influence a witness in the judicial proceeding involving the Holly Bobo case. Coercion of a witness is a Class D felony. Adams, 29, pleaded not guilty to charges of first degree murder and especially aggravated kidnapping in the case last month and remains in the Chester County jail without bond. He is next scheduled to appear in court for a status hearing April 9. Meth bills with different caps on how much pseudoephedrine you can buy without prescriptions headed to the floors of the TN House & Senate. Gov's meth bill moves out of House Health committee on voice vote. House Health com hears Gov's amended meth bill allowing 5.76g or 48 12hr tablets of pseudoephedrine/month. It's 28.8g/yr w/o prescription. Accused #HollyBobo killer Zach Adams asked fellow inmate being transferred to tell his brother to stay quiet or "be in the hole beside her"
This is one sick scumbag!!!!! They need to put him and his brother in a room together for a long time and video it. John Dylan Adams is being held in Obion County on federal charges involving a Sept. 16 indictment that charges the younger Adams knowingly “possessed, received, concealed, stored, bartered, sold and disposed of a stolen firearm” on or about July 13, 2013, along with a Jason Kilzer. The indictment said a .38-caliber revolver was shipped and transported in interstate commerce with knowledge that it was stolen. John Dylan Adams was also charged with receiving and possessing the firearm through interstate commerce with the serial number removed, obliterated or altered. He was charged with aiding and abetting Kilzer and giving Kilzer the gun after knowing it was illegal for Kilzer to own the gun. The indictment said John Dylan Adams was an unlawful user of controlled substances or an addict. John Dylan Adams is being represented in the federal case by M. Diane Smothers, a federal public defender. Prior to the most recent charge of coercion of a witness against Zachary Adams, Smothers told a Jackson Sun reporter in mid-March that she did not wish to comment on the Holly Bobo case and that John Dylan Adam would not be available for an interview. The Madison County Sheriff’s Department arrested John Dylan Adams in Madison County on Sept. 25 and turned him over to the U.S. Marshals Service after an arrest warrant was issued on Sept. 16. White said she and Franks came up with the idea for another rally, a “Justice for Holly” rally. The rally will begin at Corinth Baptist Church on Saturday with a noon prayer time, followed by a 1 p.m. community vigil. 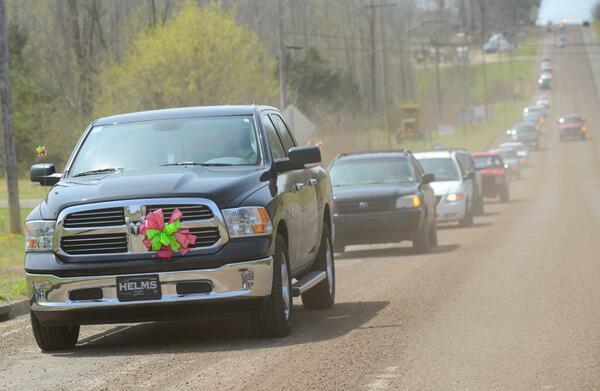 At 1:30 p.m., cars, motorcycles and trucks will be decorated for a parade that will leave the church, drive through the community, circle the Decatur County Courthouse and drive back. White said she is asking the community to come pray for justice for Bobo and the investigation, and then join the parade in support for the Bobo family. Now, White said, the awareness colors for Bobo will change. 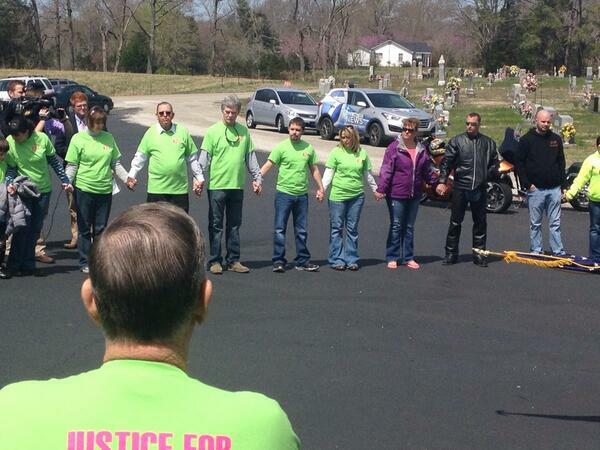 New shirts and ribbons that say “Justice for Holly” will be lime green and pink. She said Corporate Image, a custom screen printing and embroidery business in Lexington, has already sold 2,000 shirts. White said that other than the production costs, all the proceeds from the shirts’ sales have gone to the Bobo family to ease financial struggles that have come from searching for Bobo and to assist with costs that might come from a possible future trial. White said a “Justice for Holly” fund has been set up at the church. “We want to make sure the family gets justice and sees closure,” White said. 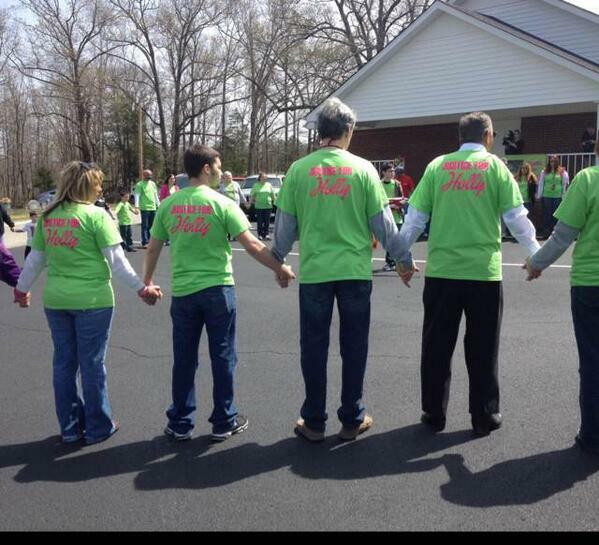 Friends, family gathering within the next hour at Corinth Baptist in a prayer service for #HollyBobo. Bike ride to follow at 1:30 cst. The man accused of murdering Tennessee nursing student Holly Bobo still has not retained an attorney, it was revealed Wednesday, even as he faces an additional charge related to threatening to kill his brother. Zachary Rye Adams, 29, wasn’t required to appear in Decatur County court, prompting Circuit Judge C. Creed McGinley to announce he would force the suspect to attend future status hearings. An attorney represented Adams in court Wednesday, but the convicted felon hasn’t officially retained her, reported The Jackson Sun. “Until Mr. Adams is present, I am limited in what I can do,” McGinley said. The state has refused to begin discovery in the case until Adams retains a lawyer, according to NBC affiliate WSMV. Adams pleaded not guilty last month for the kidnapping and first-degree murder of Bobo, who was 20 when she vanished from her home in western Tennessee on April 13, 2011. Authorities have not revealed why they believe Adams is a suspect, and have not said whether they have recovered Bobo’s body. Page created in 2.167 seconds with 21 queries.